I'm back...same as the last couple seasons...Sports Club Stats added a ton more content, so I suggest checking it out...I'll be working on adding some of it in here, but I just wanted to get this up with a month left in the season...Any mistakes or special requests, let me know. The colors are pretty self explanatory...Green = Win, Red = Loss, Yellow = OT/SO Loss. If you have any requests for more stats, let me know. I can try to crunch them if I have time. I take the probability charts from Sports Club Stats. Check it out, they have a lot of great info. 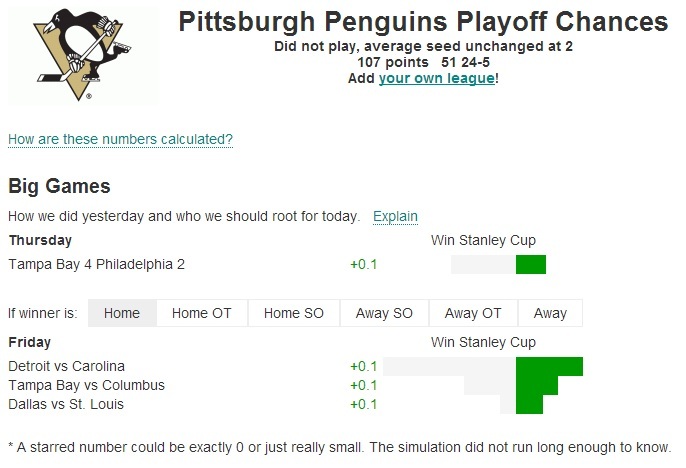 Another good site is Playoff Status. An explanation of the numbers above can be seen here. Last edited by ChiTraderRob on Mon Apr 22, 2013 1:23 pm, edited 7 times in total. We can lose all of the rest of our games and still make the playoffs. Good stuff. 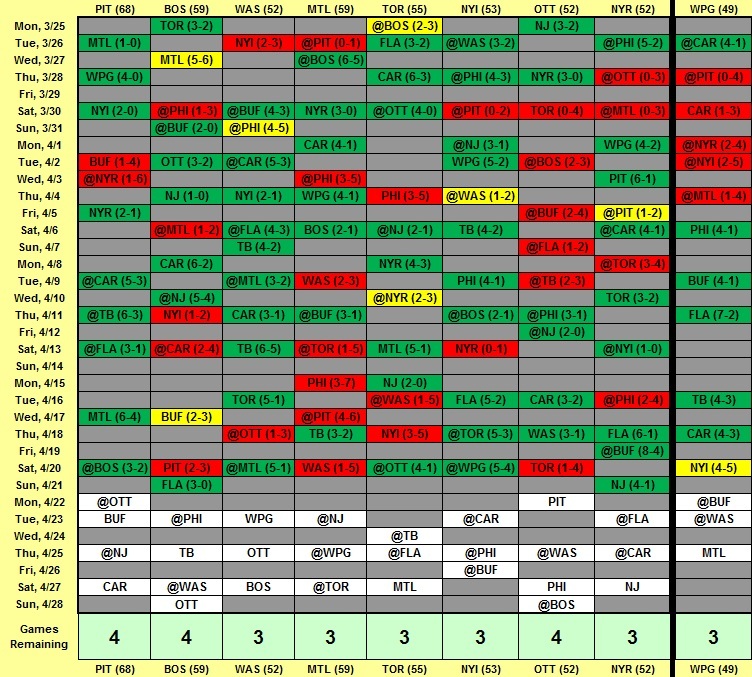 Updated as of 3/26...Added in First Round Opponent probabilities. You'll have to forgive me if the updates come somewhat intermittently, as I am pretty swamped wit a ton of stuff right now, but I'll do my best to get to this every day. Updated as of 3/30...Happy Easter! Is anyone else not seeing the updated spreadsheet in the original post? I used to see the games color-coded when completed. Or is that update in one of the links? Sometimes you need to clear the cache, or close the browser and reopen? ChiTraderRob wrote: Sometimes you need to clear the cache, or close the browser and reopen? Very strange that this just started happening as I never had an issue before. Must be something on my end. Hmmm. The MN is calc'd at 4, but SCS has Pens as "In" and PlayoffStatus gives clinching options with tonight's Rangers game to clinch 8th outright or 7th with that plus help*. 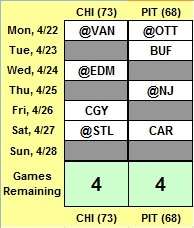 *edit: Turns out the help games listed for clinching 7th - WPG over PHI and TB over NYI are on Saturday. Seems as if things are becoming clearer with less than 10 games to go. Then a whole lot of teams fighting for the last 3 playoff spots: Ott, NYR, NYI, NJ, Win/Was, Buf, Phi. Can Ottawa stay in the playoff picture or are they fading late? (Win/Was) Who will win the SE division? Will the other team even make the playoffs? Are Buf and Phi even still in the playoff hunt? Are these "must win" games for both tonight? 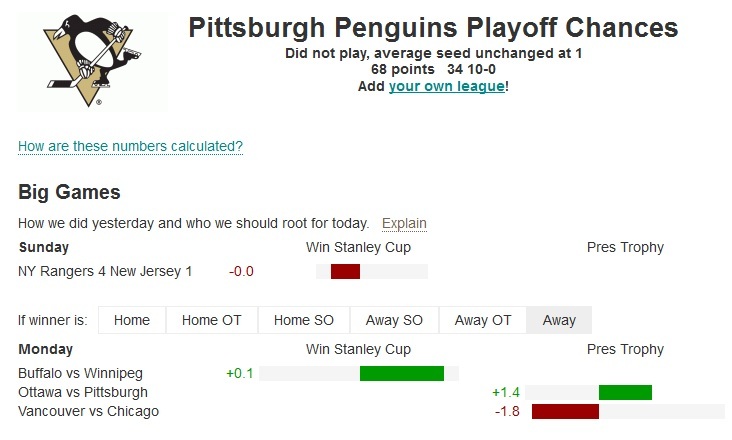 Who will finish in the 7/8 spot and play the pens in the first round? Maybe Pho, Dal, Edm, Col or Nash with a late surge to make the playoffs? Seems doubtful. Maybe he could had a bonus section for following the Flyer's data for them to be officially eliminated?